A line of tiny, fluffy, yellow and tawny-coloured goslings follows her across, looking neither this way nor that, intent on doing their mother’s bidding. And she’s intent on getting to the grass on the other side of the wide road. Thank goodness the cars stop. I see they have a crossing guard for them. The whole thing made the motorists smile, if slightly bemused. Cute post, Cynthia! They’ve taken over the parking lots at local shopping centers. Yikes. that’s not so much fun, right? Especially when they leave little bits of poop behind…. I saw a similar post about a mama bear and her babies recently. I’m surprised there are still any non-humans left though the way we abuse our planet 😦 she adds, cheerfully. Good point! If I’d seen the bears, though, I woulda escaped the scene quickly! 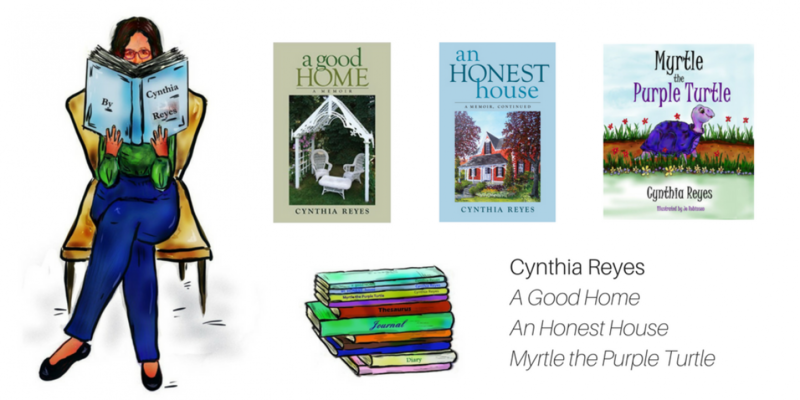 How cute and precious Cynthia – lucky folks made way for them! They are probably wondering what all the commotion is about! You may be right! They looked entirely unfazed. Awww, sweet photos! And fortunately respectful motorists. That’s a a very visual response. I can see the turkey’s wandering into the ED. 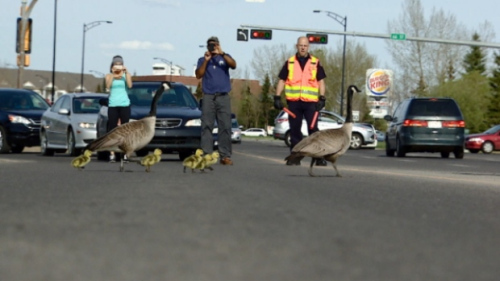 I love the story of the geese crossing and the positive effect it had on the motorists! Thank you! The motorists were a bit bemused by the whole thing, but no-one moved. I was riding on the Mississippi River this past week and saw many babies and their mothers. They are so darn cute I almost fall off my bike when I see their fuzzy little babies. I want to get off and pet them but mama wants to bite my leg-LOL. I enjoy riding each week and seeing them grow, but never are they cuter when they are floating on the river next to mama or laying in the grass! A big bundle of joy!!! They really are a sweet sight, Robbie. And the fuzz on the babies — so soft to touch. The mamas are fierce, though. And they give out a hiss to warn anyone who comes close to their babies. Hmmmm .. I had commented on this and suspect I didn’t hit “Post Comment! Oy. Anyway … I, too, love these moments and have experienced them down this way with ducks, never geese. 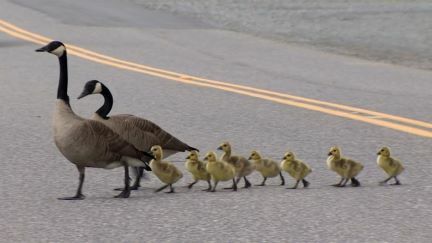 If all the people in traffic can have the compassion to stop for a goose/duck and her babies, why can’t we humans all get along a little better? I think this was the very first post I ever read of yours, Cynthia. I love it! Me too! I had it slated for reblogging, but then Kerry (KerryCan) published a post about duck crossings, and I was inspired to publish mine soon after. 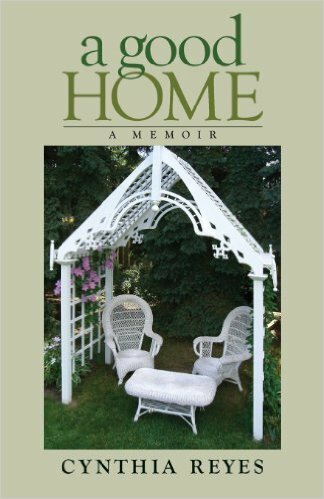 So glad we became blogger friends, Clare. Thank you. Oh, I am so glad too, Cynthia! Thank you, Eddie. Your comment is generous. Very cute. And I love that we stop for them. Very Canadian spring event.